FINALLY. My feelings about the newest adaptation of one of my favorite novels ran the gamut from completely disinterested to finally refusing to wait a month for Netflix to send it to me. That last bit of impatience was mostly due to seeing Michael Fassbender in X-Men: First Class and realizing that he is a very, very good actor. I had been very skeptical of the casting of Jane Eyre for some time, but as it turns out, I shouldn’t have been. The acting is the strong point (very strong indeed) of the film. Mia Wasikowska made a very fine Jane, and Fassbender absolutely owned as Rochester. The magnificent Judi Dench made a truly excellent supporting turn as Mrs. Fairfax, and I wish Jamie Bell had gotten a little bit more screen time as St. John Rivers. The film is also very beautiful to look at, and I think it hit all the right notes of the story. Where it fell down for me was in its pacing, and in having lost some of the gothic feel of the novel. If I remember correctly, the trailers tried to play up the “creepy” angle, but I found none of that to actually be in evidence in the final cut. Overall, the movie is absolutely worth seeing for the performances, but it’s my opinion that perhaps Jane Eyre is just not a novel to be served well by film adaptations. Too much of the overall feel and heart of the novel was lost, and there’s really not enough “action” to hold a movie together when large chunks of the book are taken up by narration. I guess I’ll have to get around to seeing some of the other adaptations (yes, yes, Dalton, I know) and see if they’ll prove me wrong. This one was in my husband’s Netflix queue, and I sat down to watch it despite being fairly ambivalent about the whole thing. And actually … I kind of loved it. A lot of the basic tenets of superhero-dom are rather impractical, and as much as I enjoy a good superhero movie, they always sort of bother me. Things like … who cleans up the mess? Hancock addresses this by being the story of a superhero (Will Smith) who is sort of a public relations disaster. Even though he fights crime, he’s still seen as kind of a freak and an outcast. As such, he’s also a drunk and an a**hole, and the city in which he lives is tired of putting up with his messes. Enter Ray (Jason Bateman), a down-on-his-luck PR guy. After Hancock saves his life, he decides to make cleaning up the hero’s act his project, against the wishes of his wife Mary (Charlize Theron). I’m sure you can see where this all goes, at least in part. I won’t spoil it for you. I really enjoyed the tone of the movie and the way in which the downsides of being a superhero were addressed. The second half of the movie gets a little bogged down and frankly, hard to follow, but overall I think that the talent here manages to pull it through and sell the whole thing. The cinematography is a little funky, and sometimes the effects look pretty cheap, but again, it’s the stars you’ll want to watch. Definitely recommended for fans of the genre. Yay, movies! Did you guys watch anything fun this weekend? It’s now the turn of Crash and The World is Not Enough (a rewatch, but we’re finishing up the James Bond project) to sit around on the coffee table for a while. Coming into a busy stretch of time, but I’ll try to make sure my loyal readers have something with which to waste a few minutes, I promise! Alright, so first things first: This trailer is probably not exactly SFW. Apparently, this movie is about the invention of, er … personal massagers. You know? It’s got a fun British cast, including Jonathan Pryce, Rupert Everett (oh, how I’ve missed you!) and Hugh Dancy. It also has Maggie Gyllenhaal, because apparently there were just no good British actresses available? Ordinarily I don’t complain about such things (and I do like Ms. Gyllenhaal), but her accent is kind of suspect. Anyway, I think this looks fun, funny, and charming. It’s not a “rush right out to the theatre” feature, but it’s definitely a fun Friday night Netflixer. Don’t you think? FINALLY. Shakespeare. Ralph Fiennes directing and starring. Also starring: Gerard Butler, Vanessa Redgrave, Brian Cox, Jessica Chastain. Woo-freaking-hoo. No, seriously. I finally saw Harry Potter 7.2 last weekend. Prior to seeing it on Saturday, my head was full of all the things I wanted to write about it. I count myself a pretty big fan … not from the beginning, but pretty close. I saw the first movie in a midnight showing, and blah blah blah. I was going to recount for you my personal experience with the Harry Potter franchise. And then I saw the movie. After that, I found I had very little to say. Because it was over. Really and truly, properly over. And I’m totally fine with that. I believe this is what is called “closure.” Of course, though, there’s plenty to say about the individual movie, and about its position within the larger franchise, so we’ll do that. Onward! If you have not read or seen any Harry Potter by now, I am going to assume that you have no interest, and are therefore skipping this post. If you are, on the other hand, into it, I don’t feel that I need to give you the usual synopsis. You know the story by now. I think that, taken collectively, Harry Potter and the Deathly Hallows is probably my favorite of the movies. 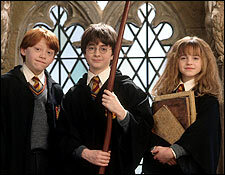 I know that a lot of people thought part one was excessively boring, what with Harry, Hermione, and Ron just sort of wandering around and experiencing a lot of teenaged angst. That movie did exactly what it was supposed to do, though, in setting up all of the events of part 2. Additionally, I really enjoyed the opportunity to take a break from all the action, as it were, and take stock of the characters themselves. They’d been forced to grow up at an exponentially faster pace throughout the series, and in the Deathly Hallows, we get a chance to see how that growing up as worked out for them. They’re making tough choices, realizing things about themselves and each other, and they’re facing up to a pretty grim reality. The actors, too, have grown up, and we’ve witnessed that as well. They’ve all become very capable, and that was an enjoyable thing to watch. With regard to 7.2, I think that it picked up very smoothly from where 7.1 left off, both in terms of the plot and the abilities of the actors/development of the characters. In the end, I think that Daniel Radcliffe, Emma Watson, and Rupert Grint have all done a fine job, never mind the glittering cast of supporting actors, most of Britain’s finest. There’s really nothing bad to be said about the acting. Three cheers for Ciaran Hinds, completely unrecognizable as Aberforth Dumbledore. Three cheers for Matthew Lewis, who has grown (along with his character, Neville) into the unsung hero of the franchise. Hurrah for Maggie Smith and Julie Walters getting to have some fun scenes. And finally, a round of applause for Helena Bonham-Carter for bringing a great amount of good, scary fun to her role as Bellatrix Lestrange. The supporting characters of these movies really show you how quality the entirety of the franchise has been. I can’t leave the acting side of things, of course, without saying a few things about Alan Rickman, and his character, Severus Snape. Let me be clear: I really loathe Snape. We’re supposed to. Heroism aside, he’s still a pretty deplorable human being. Having said that, however, I think that the major failing of the Harry Potter film franchise is that it did itself (and viewers) a disservice by not giving Rickman enough screen time throughout. That includes the final movie. Rickman was, of course, fantastic, but I still feel as though he didn’t quite get his due. That may fall into the final analysis, though, which I’ll get to in a minute. What I initially thought about the movie was that it felt very perfunctory. It moves – bam, bam, bam – from important point to important point as if it’s checking items off of a to-do list. The second half of Deathly Hallows is all action, though, so it makes sense that it would be that way a bit, and besides, we all wanted to see those important points. The audience I was part of definitely cheered the big moments of McGonagall, Molly, and Neville. What is less enjoyable, though, is the way in which some more dramatic moments (Snape, Fred, Tonks & Lupin) seem to get passed over in the rush to get back to more action. Here’s the main point I want to make, though. I came to realize it yesterday, after reading RTM’s final assessment, in which she declares that HP7.2 doesn’t deliver on its advertised “epicness.” The very best thing about the world of Harry Potter is this. While J.K. Rowling created an incredibly rich and imaginative world, she filled it with real people. Magic abilities aside, all of the characters could be people we know. They’ve got strengths and flaws, some of them are equal parts good and bad, they feel happiness and pain, and they live. It is my opinion that the movies captured that aspect as well, particularly the last two. As such, I don’t think that we should want for the final act to be “epic” in the sense of a summer blockbuster. What it does convey is so much more real than that. It conveys a world in which nobody knows whether they’ll live to see tomorrow, a world in which young people are asked to make sacrifices and look inside themselves to find bravery and strength they didn’t know they had. The final days of the battle these people are waging are not epic; they’re exhausting. They’re moment after moment of triumph and then despair. One step forward, two steps back. And to me, whether or not I would’ve liked a few more moments to weep over the deaths of “friends”, or a bit more screen time for certain characters, the movie captured that perfectly. The movement from point to point signals a sense of numbness, of the job still to be done, in spite of everything else. And in the end, there’s no celebration. It is epic, but in a quiet way. This is the way the world ends. Not with a bang, but with a whimper. Finally, the only thing left to say is Thank you. Thanks to Ms. Rowling, and to all of the people who brought her world to life. All the little nit-picky complaints we have about the movies should give way to the realization that we care enough to make them, and that means that something amazing has happened, and that it will not be easily re-created any time soon. From the first moment to the last, I’ve enjoyed every second, and I look forward to sharing it with my daughter (when she’s old enough) in the hopes that she, too, will find it all magical. Tom Hardy. Gary Oldman. Toby Jones. John Hurt. Ciaran Hinds. Colin Firth. Mark Strong. Stephen Rea. Do you need more? No, I didn’t think so. I am excited about this movie. If you’re not yet, watch the trailer, then get back to me. I first saw Streetcar about 10 years ago, with some friends. Frankly, I didn’t remember much about it beyond the fact that I thought it was really, really weird, and that I probably didn’t “get it.” Since it is number 45 on the AFI 100 list, I recently got to see it again. It’s still really weird, but I think I “got it” a bit more this time around, and could appreciate it for its merits. A Streetcar Named Desire is based on a play by Tennessee Williams, set in New Orleans after World War II. 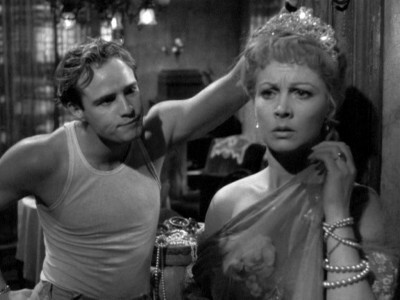 It follows Blanche Dubois (Vivian Leigh), a mentally unstable woman who comes to New Orleans to stay with her sister Stella (Kim Hunter) and her husband Stanley (Marlon Brando). Blanche’s tenuous grasp on reality becomes weaker as she is bullied by Stanley and attempts to make a match with his friend Mitch (Karl Malden). Ultimately, she drives a wedge through Stanley and Mitch’s relationship as well as that of Stanley and Stella. Sorry for the really clunky synopsis. It makes the movie sound, well, only a little more boring than it actually is. This is definitely one of those where people mostly stand around and talk; one that is obviously based on a play with very little action or change of scenery. With such movies, you can assume that it’s the acting that makes them great, and Streetcar is no exception. Leigh, Hunter, and Malden all won Oscars for their roles, and Brando received a well-deserved nomination. The film received a whopping twelve nominations, in fact, many of them artistic, but with Best Director and Best Picture nods as well. Director Eliza Kazan works extremely well with the lack of scenery, utilizing small spaces to portray Blanche’s turmoil and to make what action there is seem much larger than it really is. All in all, it’s one of those movies that you can watch and appreciate for what it does well, but that you won’t necessarily enjoy. I definitely got a lot out of a second viewing, but my husband, seeing it for the first time, was mostly just incredibly frustrated. That in itself is a testament to the revelatory performance by Vivian Leigh. She changes in an instant between being demure, superior, and intellectual to weak and unhinged, or to a tower of anger and strength. Overlying all of those changes, though, is a clear sense of manipulation. Blanche is constantly trying to take everyone in, maybe even herself, and Leigh really brings that across in a way that makes it difficult to feel any sympathy for her character. Brando also turns in an amazing performance as the brutish Stanley. He and Blanche are, in some ways, two sides of the same coin; they’re both trying to rise above, but are both pulled back down by their natures. As such, the characters are nearly too volatile to be in the same room together, and Leigh and Brando are magnificent in portraying that tension. In thinking about it, I’ve started comparing Streetcar to The Lion in Winter in that they’re both based on plays and are therefore mostly talking and powered by great acting. The Lion in Winter manages to maintain a level of tension throughout that draws the audience in and keeps them interested, even without any action. I think that Streetcar doesn’t quite manage to do the same thing; the emotion and drama fail to keep one riveted quite often, and we are left with Blanche’s histrionics. While Vivian Leigh’s (and Brando’s) performance is indeed first-class, it’s not always enough to hold the viewer’s interest, sadly. Still, if you’re looking for drama and great acting, you could certainly do worse than this.